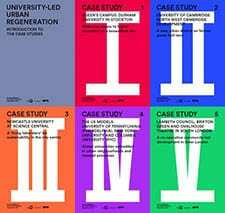 UCL Urban Laboratory has recently launched five case studies in university and community-led urban regeneration, which explore the role of universities as actors in urban renewal processes, and the potential for communities to engage and take a lead in such processes. The case studies and introduction are the output of an 18-month research project, conducted by Dr Clare Melhuish, in parallel with the announcement and development of proposals by UCL to build a new campus in the Queen Elizabeth Olympic Park, Stratford. In March 2015, the Urban Laboratory published a summary of interim findings from the research. The case studies now provide detailed insights into the processes of visioning, communicating, and developing urban spatial development plans which many universities are undertaking, often in partnership with other urban and regional regeneration agencies, and as a stimulus and anchor for wider urban development. They include Queen’s Campus, Durham University in Stockton; the NorthWest Cambridge development by University of Cambridge; Newcastle University at Science Central; three US models – University of Pennsylvania, New York University, and Columbia University; and lastly Somerleyton Road in south London, a partnership between Lambeth Council, Brixton Green and Ovalhouse Theatre designed to promote a new model for community-owned affordable housing and social infrastructure. Each case study is presented in the same format for comparative purposes, structured in five sections: historical and policy contexts; structures and processes; visions and narratives; translation into place; and a concluding section summarising key issues and learning points. They draw on a mix of bibliographic and archival research, interviews, site visits and observations, and photographic documentation, with a view to developing some qualitative insights pertaining to specific projects as well as identifying some overarching principles. The case studies are prefaced by an introductory essay which provides an overview on university development, and sets it in context with reference to some of the main shifts in urban regeneration and higher education policy and practice (see also Policy Milestones), while highlighting the international scope of university expansion within cities as an aspect of the global production of cities as ‘policy assemblages’ from elsewhere (McCann and Roy 2013).